For those living in the Washington, DC area, gaming options were once few and far between. Not so long ago, Atlantic City was one of the only viable gaming destination nearby. But on December 8th, 2016, MGM Resorts International opened a new, massive Las Vegas style gaming resort in National Harbor, Maryland. The new casino and hotel is just minutes away from America’s capital in Oxon Hill. It’s the sixth casino to open in Maryland since 2010. Set on the picturesque banks of Potomac River, the new MGM National Harbor features a suite-filled hotel, a 3,000-seat entertainment venue backed by an A-list music lineup, four world-class dining options, numerous bars, a tasting market, a Shake Shack, and a Capital-caliber dessert destination in Bellagio Patisserie. We think you’ll agree that it’s the best casino near DC! Room options are available with views of either the nation’s capital or the majestic Potomac River. In addition, the MGM National Harbor offers some of the biggest and best hotel rooms near Washington, DC. Here, 48” HD LCD TVs come standard, and each room provides a deluxe work station, complete with a full business desk and executive chair. In the wash room, you will find stone vanity sinks, plush robes, and cozy slippers. And the feather-soft Serta mattresses provide guests the perfect ending after a full day of dining, gaming, and entertainment. Guest amenities also include high-speed wi-fi, blackout shades, mini bar, in-room delicacies, and more. With suites ranging from a modest 588 to a sprawling 3,210 square feet, every inch of the hotel was carefully designed and thoughtfully considered. For distinguished guests, it’s coveted space offers a true oasis to escape from the fast-paced world of Washington, DC. The crown jewel of them all is the Chairman Suite. A farewell to moderation, this expansive suite boasts 2 king beds, dining for eight, a massive living area for entertaining, a 75’ HD LCD TV, a powder room, oversized roman spa tub, dual vanity sinks, a butler’s pantry with wet bar, a mini bar, and a view that will have you gazing at national monuments and posing for memorable moments. For guests and visitors of the MGM National Harbor, world class cuisine is always steps away and some are open into evening. The Voltaggio Brothers Steak House, named after Bryan and Michael Voltaggio, serves up filets in a homey setting. The two gained instant fame from their memorable performances in Bravo’s Top Chef. At Marcus, chef Marcus Samuelsson dishes out popular southern-style fare similar to that served at his Red Rooster Harlem restaurant. The menu includes the Whole Bird Royale, which includes a whole fried chicken, collard greens, biscuits, and shells with cheese. Get elevated comfort and soul food to fuel your festivities! 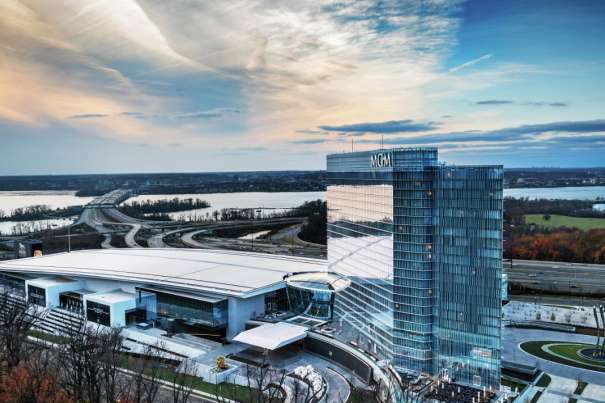 The opening of the MGM National Harbor marks the beginning of a new era for the Washington metropolitan area. Area residents now have the opportunity to enjoy world-class gaming that are on par with other iconic MGM-owned casinos, such as Bellagio, MGM Grand, ARIA, and other Vegas staples. And by adding a luxury hotel, fine dining, celebrity chefs, and a luxury spa, the sky’s the limit for visitors—no matter what floor they find themselves on. The Maryland casino resort has created thousands of jobs for state residents, especially those living in Prince George's County. Both the interior and exterior spaces reflect the great history and geography of the DC metro area, and provide expansive views of national icons. From the lobby to the rooftop pool, no detail was too small to perfect. entertainment including Boys II Men, Bruno Mars, and Lionel Richie. While it may reside outside of Washington, DC, it’s truly the entertainment capital of the U.S. capital. If the A-list talent is any indication of things to come, the MGM National Harbor is poised to entertain generations of gaming lovers traveling from Maryland, Virginia, DC, and beyond.